The first area inhabitants of the area were members of Native American tribes of the Miami, Delaware, Wea, Potawatomi, Shawnee, Wyandot, and Winnebago. By most counts there were 17 Native American villages in the greater Lafayette area. The French arrived in the late 1670’s when it was first explored by Robert Cavelier and Sieur de la Salle via the Wabash River. The Native American tribes, especially the Wea made fast trading partners with the French. The French traders treated the Native Americans well as trading partners and frequently rewarded them with gifts. In 1717 the French trading post Fort Ouiatenon was established on the shores of the Wabash River (approximately a mile down river from where the recreated fort stands today) to protect the French and Native American traders and stop the British exploration of the area. The French and British fought over the area for a number of years (French and Indian War 1754-63) with the British finally taking the Fort in 1761. The changes brought to the area by the Europeans, specifically the British who demanded higher prices for goods, were not welcomed by some of the Native Americans inhabitants. Tecumseh and his brother, Tenskwatawa or the Prophet, established a home base for a tribal confederation at Prophetstown (just north of Lafayette One of the primary purposes of this confederation was to preserve the Native American lands and their way of life. 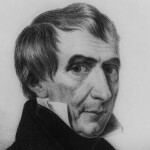 Then Indiana Territory Governor and future U.S. President William Henry Harrison was buying Native American land within the territory so it could be settled. These treaties enraged Tecumseh and his confederation. He made an agreement with the British to side with them against the United States if war broke out and in return, the British supplied the confederation with arms and supplies. In time, his confederation battled the U.S. Army at the Battle of Tippecanoe on November 7, 1811. The War of 1812 between the United States and Britain broke out a short six months later. In the years following the War of 1812, Indiana joined the Union on December 11, 1816, becoming the 19th State. In the early 1820’s a settlement called “Jacktown” took root across the Wabash River on the top of the hill overlooking the Wabash River near what is presently known as The Village. The area nickname was derived from Captain Samuel Benjamin Jackson Castor who owned the blacksmith shop at the top of the hill. In 1836 Augustus Wylie laid out a town he named West Lafayette, with 140 lots, on the west banks of the Wabash just below downtown Lafayette (near where the West Lafayette wastewater treatment plant is today). While it appears at least one home was built, full development of this plan was never accomplished as the area was frequently flooded by the River. Other settlements and villages began to spring up as well. The village of Kingston was laid out in 1855 by Jesse & Jane Lutz (pronounced “Loots”) and in 1860 the Chauncey Family from Philadelphia platted an adjacent settlement they called “Chauncey”. In 1866, the Kingston and Chauncey settlements formed a municipal government that took the name Chauncey to honor the Chauncey Family and received its charter in 1867. As a chartered town, Chauncey could establish its own government and school system. The town remained a small but growing town for the next number of years. In May 1871, Chauncey votes to be annexed by Lafayette as the town did not have the resources to build the infrastructure (sidewalks, improves streets, police and fire protection, etc.) necessary to support the growth of Purdue University which had been founded in 1869 and opened its doors in 1874. The City of Lafayette refused the annexation because of the costs involved. In May 1888, about 152 resident voters (remember only free white males could vote at the time) of Chauncey successfully petitioned the town board to change the name of their community to West Lafayette primarily because mail was not being delivered to Chauncey (it had no Post Office), but mail addressed to West Lafayette would be delivered. At this time most West Lafayette stores and services (e.g. contractors, blacksmiths, hardware stores, a livery stable, boot and shoe stores, general stores & produce stands) were situated along the State Street levee and up State Street Hill from North River Road in today’s Village area. 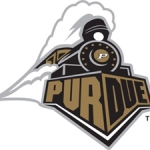 By the 1940’s both Purdue University and West Lafayette had established themselves as strong partners in growth and support, a relationship that continues today. The map of the New Chauncey Neighborhood takes its boundaries mostly from the original town of Chauncey or the Kingston and Chauncey villages: River Road to the east, Kingston Drive and Meridian Street to the north, Northwestern Avenue to the west and Fowler Avenue to the south. Today, the neighborhood’s spirit remains embodied in the diversity of its residents and its architecture. As one drives, walks or bikes along our streets, one appreciates the many architectural styles ranging from the late 1800’s to the first half of the 1900’s, telling much of the growth of the neighborhood and city. Our residents are equally diverse, including families and singles, young children and retired people, temporary and long-term, from all walks of life. 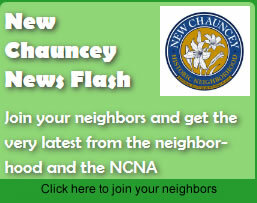 Our residents formed the New Chauncey Neighborhood Association (NCNA) in 1977 for the purpose of preserving and rejuvenating the architecture and quality of life in the neighborhood. The association initiated the construction of its neighborhood Centennial Park, promoted rezoning to stabilize and preserve its valuable historic housing stock, and promotes activities that enhance the safety and comfort of its residents. NCNA maintains an active role in shaping the future of West Lafayette, and was instrumental in founding the West Lafayette Neighborhood Coalition and the CHAUNC-PAC political action committee. The NCNA Leadership Team meets quarterly and hosts an Annual Meeting typically in October to discuss neighborhood issues and maintain a network of informed citizens. Meetings are open to all residents of the neighborhood.